Rosin build up on violin strings can make them sound scratchy. 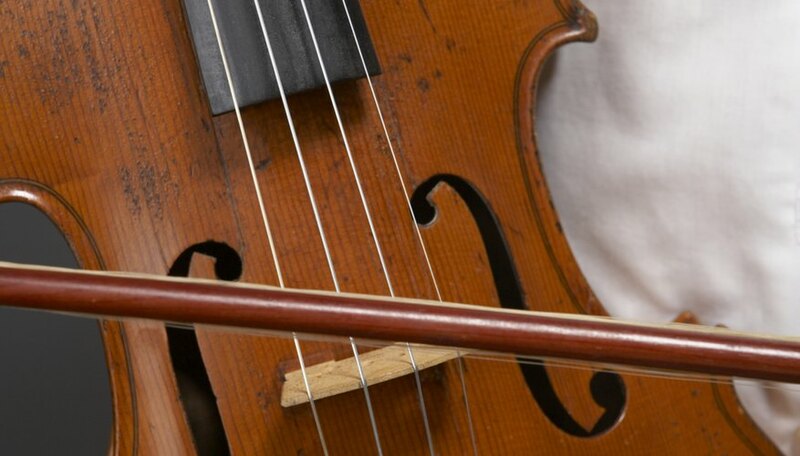 Although applying rosin to the bow is important to create friction when the bow is pulled across the strings, too much rosin on the strings can reduce the strings ability to vibrate. Clean the rosin off your strings regularly to reduce any scratchy sounds. Avoid touching the body of the violin with bare hands during the string cleaning process as our fingers have natural oils that can be harmful to violin varnish. Run a lint free cloth over the strings. Use your thumb and first finger to pinch the cloth around the string. Rub this cloth methodically from one end of each string to the other. Wipe a clean cloth over the body of the violin to remove any rosin dust that has been created. Rosin is slightly acidic so can damage varnish if left on the body of the violin. Check the stings. If the strings look clean, you have removed the rosin build up and the violin will sound less scratchy when it is next played. If there are patches of rosin remaining on the strings continue to the next step. Moisten one corner of the cloth with string cleaner. Use your thumb and first finger to pinch the cloth around the string. Rub this cloth methodically from one end of each string to the other. Avoid making the cloth too damp with string cleaner as you do not want it to drip on the body of the violin as you clean the strings. Wipe over the body of the violin and the wood of the bow with a clean dry cloth to remove any additional rosin dust that has been created. Next time you play your violin, it will sound less scratchy. Violin string cleaner is available from music shops and online retailers. Hazel Black started writing professionally in 2010, specializing in music and the arts. She holds a Bachelor of Arts in music from the Liverpool Institute for Performing Arts and is studying journalism at the University of London.